One of the most interesting aspects of The Movement was the inclusion of Katharsis, a villain from the Batgirl-verse. Specifically, she was an enforcer for a recurring villain that Gail introduced in Batgirl: Knightfall. Since then Katharsis made her way to Coral City and joined the vigilantes of The Movement, also as an enforcer-type, doing the rough, hands-on work that the others can’t quite do. 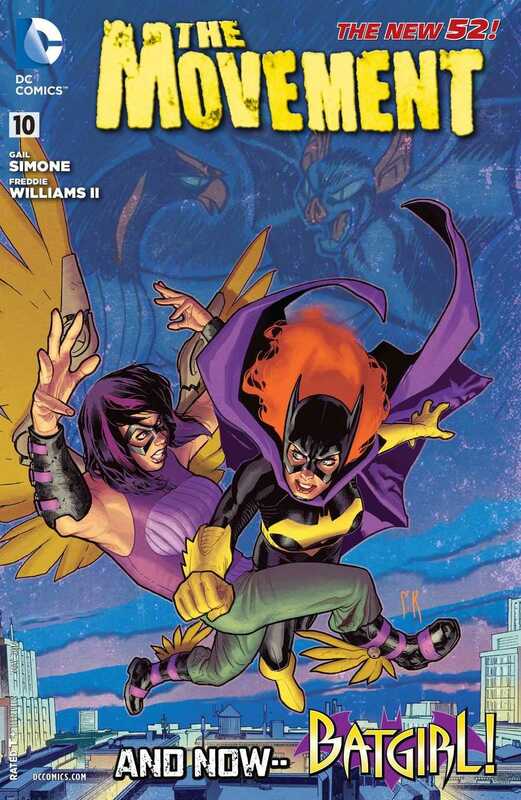 Consequently, she definitely has a history with Batgirl and Gail played that up in the previous issue to the max. It was quite fun to watch these two duke it out once again, and now in the new issue Gail brings that particular subplot to a close, in a very dramatic fashion that highlighted the personalities of the two women, their attitudes and their approach to villains. But of course, the meat of the story is all about how Batgirl’s approach differs from that of The Movement’s. It is also about establishing new friendships and new connections, finding allies in the unlikeliest of places. And along the way, we see how Gail uses Batgirl’s past history, especially one of her most defining and life-changing moments as a hero, to show how she is still suffering, and how she still gets set on an edge. She has done it again and again on Batgirl and she does that here too. Gail uses these personal connections to explore who all these characters are. And we also get to see some kind of a resolution to Mouse’s infatuation and love for Hurricane. It is here where Gail wins another point for diversity inclusivity in comics. Because, as it turns out that Roshana, aka Hurricane, is asexual. When was the last time that you got to see an asexual female character in superhero comics? I am not as up to date on superhero comics history as I’d like to be, but I’d still claim that this is quite a first isn’t it? My only regret is that with the series ending so soon, with only two more issues to go, we won’t get to see this developed further. I can only hope that at some point The Movement ends up featuring in Batgirl and that thus Gail gets to do more with them. Of course, the best case scenario would be that the trade sales for The Movement are so much better than expected that DC ends up relaunching the series (but with #13 of course, and not with a #1 like Marvel does in this cases). On the art, as the series draws to a close, Freddie does some great work once more. In a few panels, his characters had a bit of a weird case with their body dimensions, but on the whole, I liked the art. He maintains consistency with all the work that he has done before on the series and he makes Batgirl and the others all stand out, which is what I wanted, and expected. And kudos to Chris Sotomayor for delivering on the colours once again. All I can say is that if you have been missing out on this series, then you’ve been missing out on something great and unexpected. Its too late to save the series from cancellation, but I hope that you all pick up the trades and support it that way. More The Movement: #1, #2-3, #4, #5, #6, #7, #8, #9. Posted on March 7, 2014, in Comics Reviews, Review Central and tagged Barbara Gordon, Batgirl, Characters of Colour, Chris Sotomayor, Comics, Comics Review, DC Comics, Demons, Disabled characters, Female Characters, Freddie Williams II, Gail Simone, Humour, New 52, Review, Review Central, Superheroes, The Movement, Vengeance Moth, Vigilantism. Bookmark the permalink. 3 Comments.